Discover Guayaquil during your price guaranteed Ecuador vacation. All of our Ecuador tours have daily departures and are fully customizable. With its hot and sultry nights, this bustling port city couldn’t be any more different than the quiet and traditional Andean cities of Quito and Cuenca. Guayaquil is the largest city in Ecuador and the commercial center of the country, making it a great stop on your Ecuador vacation. With more than half the companies in Ecuador based in its urban streets, people from all over South America flock to Guayaquil for its relative abundance of job opportunities. The agricultural richness of the land in this area makes it the agro-industrial center of the country. Major areas of production include rice, sugar, coffee, shrimp, cacao, mango, African palm, and of course, bananas. It’s no surprise then that Guayaquil offers some of the most inventive cuisine in Ecuador. With delicious seafood soups, goat stews, and fried bananas, the regional cuisine is rich in flavor and inexpensive. 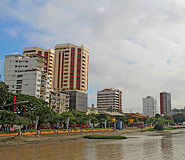 The increased income flow from its various industries has quickly made Guayaquil a popular Ecuador vacation destination. Over the last 15 years the city has modernized with excellent restaurants, boutique hotels, and trendy shops sprouting up and the extensive efforts to create a beautiful boardwalk has paid off. Today travelers will find a growing theater, film, and art scene alongside an already lively nightlife that’s largely fuelled by the city’s abundant student population. Of course, Guayaquil’s easy access to the sea also makes it a perfect location for easy embarkation to the Galapagos. While Guayaquil may not have Cuenca’s colonial charisma, it makes up for it with its cultural charm and lively, colorful people. Get caught up in the streams of guayacos wandering the Malecón (the city’s riverfront town square and cultural center) and feel the growing sense of pride in the city and its inhabitants. Explore the Malecon. 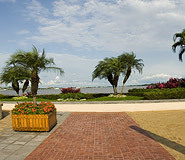 A wide, tree-lined waterfront avenue, the Malecon Simon Bolivar runs alongside the Rio Guayas. The riverfront has been turned into an attractive promenade known as Malecon 2000, where visitors and locals alike can enjoy the fresh river breeze and sweeping views. Along the promenade are various gardens, fountains, and monuments, but also a myriad of restaurants, cafés, and food courts. Toward the south end are souvenir shops, a shopping mall, and the Palacio de Cristal, prefabricated by Gustave Eiffel. North of the Malecon 2000 is the old district of Las Peñas, the last picturesque vestige of colonial Guayaquil with its brightly painted wooden houses and the narrow cobbled main street, Numa Pompilio Llona. The neighborhood is now an attractive place for a stroll to Cerro Santa Ana, which offers great views of the city and the roaring river. City tour. Complete your Ecuador vacation with a city tour of Guayaquil. There are several noteworthy churches in Guayaquil such as Santo Domingo, founded by the Dominicans in 1548; San Francisco with its colonial interior; and the Gothic-style Cathedral. Don’t miss Iguana Park, in front of the Cathedral, a pleasant shady expanse of green that has been invaded by hundreds of iguanas. Be careful not to disturb them as they lounge on every available surface and every branch in the park. For those who would like a taste of nature and history on their Ecuador vacation, both can be found in Guayaquil’s Historic Park, which recreates the city and its rural surroundings at the end of the 19th century. The park is divided in three sections: a natural area where you can observe native flora and fauna, a traditional section where you can learn about rural life and how crafts are made, and an urban section with wooden architecture and an educational farm. 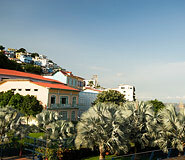 With its hot and humid lowlands, Guayaquil enjoys a sub-tropical climate. The best time to visit the city is probably during the dry season from May to December, when days are often overcast but nights are pleasantly cool. The hot rainy season on the other hand, from January to April, can be oppressively humid. The foundation of Guayaquil is celebrated on July 24 and 25 and the city’s independence from October 9 to 12. Both holidays are extremely lively and celebrated with great pomp and many public events are organized. Cultural events are usually prolonged throughout October making it the perfect time to visit Guayaquil on your Ecuador vacation. In the heart of bustling Guayaquil, this quaint guest house offers travelers an oasis of tranquility. Built high on a hill and surrounded by expansive gardens, you will feel a world away from the crowded streets of Guayaquil. With friendly staff and excellent views of the city's skyline, guests will enjoy their stay in this homey hotel. The simple, but comfortable rooms provide a private place to relax, and, although minimally decorated, are fully functional with nice linens, reading lamps, and bedside tables. Those craving some social interaction can lounge with other guests by the outdoor pool, cozy up on a couch, or play some games in the entertainment room.